Unwanted hairs on women body due to some hormonal changes and it looks ugly on woman faces. Every woman wants to remove these unwanted hairs from their cheeks, upper lips, chin, forehead and inner body. So that, mostly woman applies lots of products and shaving method to remove facial and body hair. They don’t know use of these products may cause of hair growth and shaving method make your skin rough. Every woman wants soft and supple skin so don’t need to shave your unwanted hairs. Now, what to do for removing unwanted hair? It is very important to understand how to treat with these facial hairs without any side effects on your skin. Try this Homemade Ubtan Recipe to remove your facial hairs. It is true home remedies take long time to show result but they are safe and cost effective. You can make this ubtan easily and you can use it as face wash, face mask and face scrub. Use of this ubtan will reduce your hair growth on your face and body and glow your skin color also. 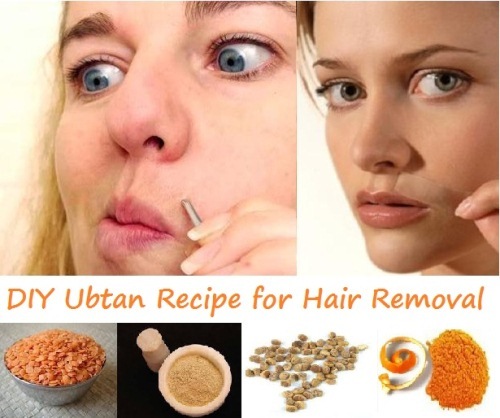 Here is the method to make ubtan for hair removal. Add 100 grams of red lentils, 50 grams of sandalwood powder, 50 grams of orange peel and 50 grams of charoli or unsalted pistachio in a grinder and grinded it properly to make powder form. Now, you store this ubtan (mixture) in airtight container, it will expire after one month. Take one teaspoon of this mixture and four teaspoon of milk, mix them and soak it for 15 to 20 minutes. You can soak it also overnight and refrigerate for excellent result. When this paste feels smoothly, you apply this paste over your face and gently spread it on your face. It will dry completely after 15 to 20 minutes. Now, you need to scrub off the dried paste gently in a circular motion. You can take little amount of olive oil and scrub it gently. It will pull your unwanted hairs. When done wash your face with lukewarm water and apply rose water on your face with the help if cotton balls. Do this three times in a week about 3 – 4 months.